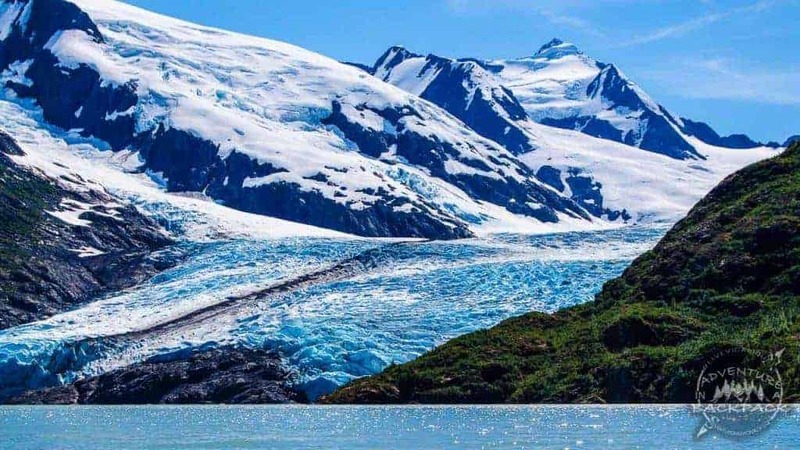 The Portage Glacier used to fill the entire Portage Valley, a vast 14-mile-long valley in the Chugach National Forest south of Anchorage, Alaska. That was hundreds of years ago, and unfortunately now only a fraction of the glacier remains. 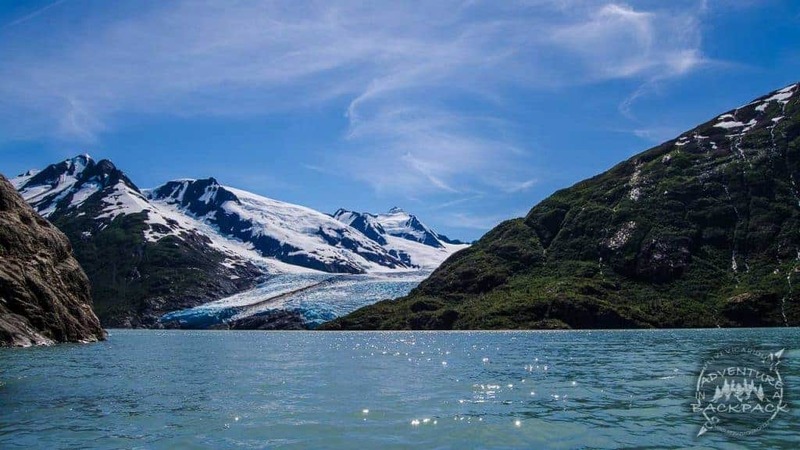 The Portage Glacier can only be seen now via boat across the Portage Lake or a two-mile out-and-back hike (listed as strenuous) out of Whittier. The only motor boat allowed on the Portage Lake is the commercial tour boat near the Begich Boggs Visitor Center. Man-powered boats such as kayaks and canoes are allowed on a specified route on the east side of the lake. 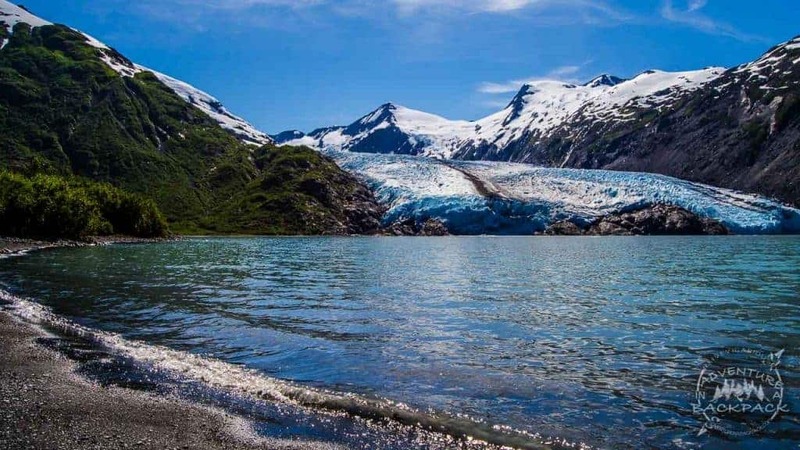 The Portage Glacier used to fill the 14-mile-long Portage Valley, but today it is a mere fraction of that size. We had a beautiful warm sunny day and took advantage of that and went kayaking to Portage Glacier. We had a long, fun day planned, packed full of activities. 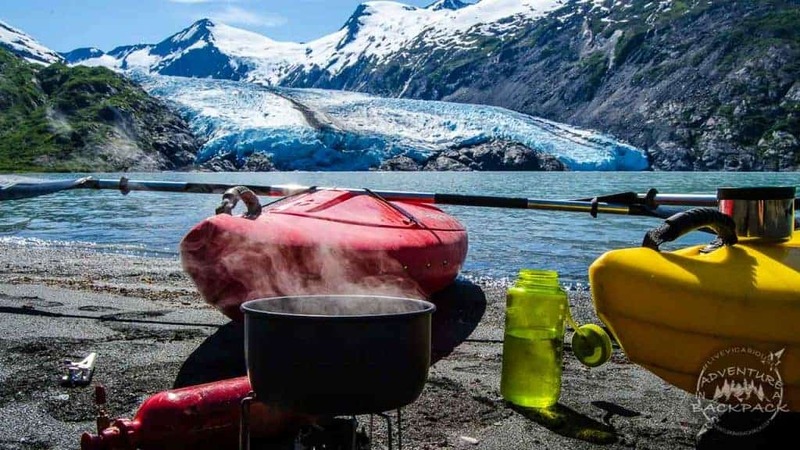 We planned on kayaking to Portage Glacier, kayaking down Portage Creek, and wrapping it up with biking back to Portage Lake from the Turnagain Arm. Related: Have you ever watched a Bore Tide come in? Click here to check out our post of the Bore Tide in the Turnagain Arm! On a warm sunny day, we headed out kayaking to Portage Glacier! Our day started out a little late after running into a few snags, but we finally got our bikes dropped off at the take-out and headed with our kayaks to the launch. The boat launch is about a quarter-mile past the Begich Boggs Visitor Center in a parking lot turnout overlooking the lake. It’s not marked very well, as this lake has just in recent years been opened up to man-powered boats. The trail is just a short walk down to the water and there is a little (and I mean little) beach where you can launch your boat. The water is cold, ice cold. Of course, it is a glacial lake and has several icebergs in it, so being cold is to be expected. Since it was a hot day, we didn’t mind getting our feet in the water a tad while we launched the boats, but we wouldn’t want to stay in the water long. 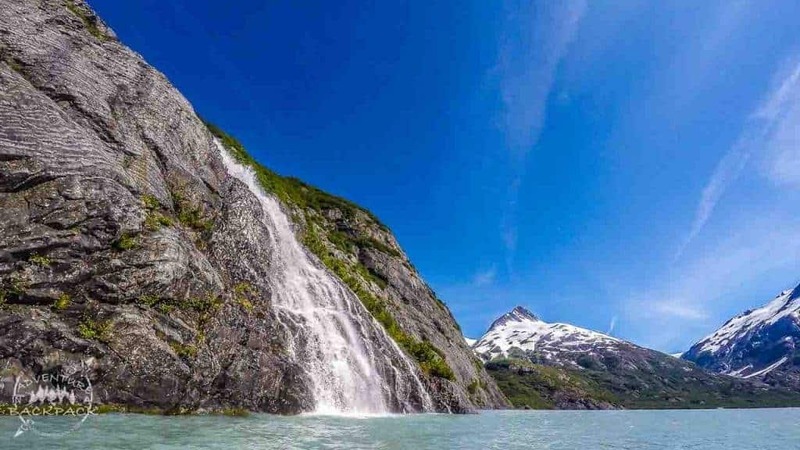 Note: While kayaking to Portage Glacier via Portage Lake was allowed while we were there, the regulations have changed several times over recent years. Be sure to check the current laws before paddling out. As you paddle out into the lake, your route stays close to the shore on the east side of the lake. You wouldn’t want to paddle out much into the lake, as it does get choppy and the tour boat does have full use of the lake. 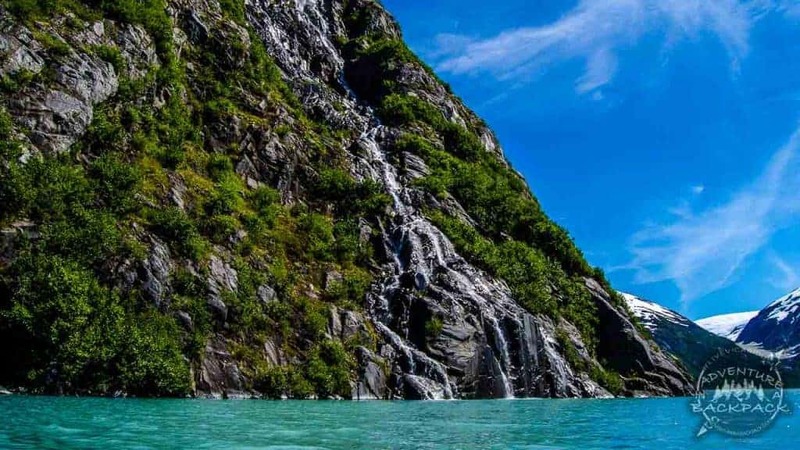 Staying near the shoreline is great, because there are so many waterfalls coming into the lake from the cliffs hanging above. Many of these waterfalls were bigger than any waterfall we had ever seen before. And we were able to paddle right up to the bottom of them! The spray from the waterfalls hitting Portage Lake was cold, but refreshing for a few moments. There are many waterfalls coming into the lake from the cliffs hanging above. Many of these waterfalls were bigger than any waterfall we had ever seen before! The spray of the waterfall hitting Portage Lake was cold but refreshing for a few moments! There was a light breeze this day, and it caused a slight headwind as we paddled out to Portage Glacier. 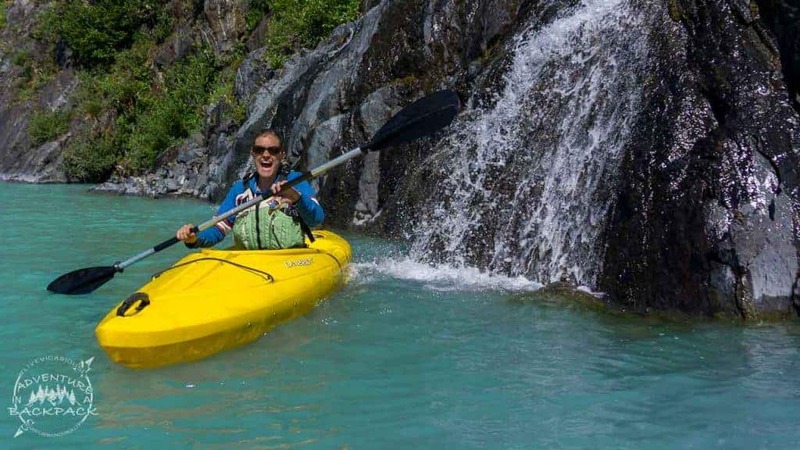 If you are planning on kayaking to Portage Glacier, be sure to pay attention to the weather and the wind. If there is more than a light breeze, it will make for a difficult paddle across the lake. The lake is deceptively large, and to fight against a headwind for that long would quickly wear you out. 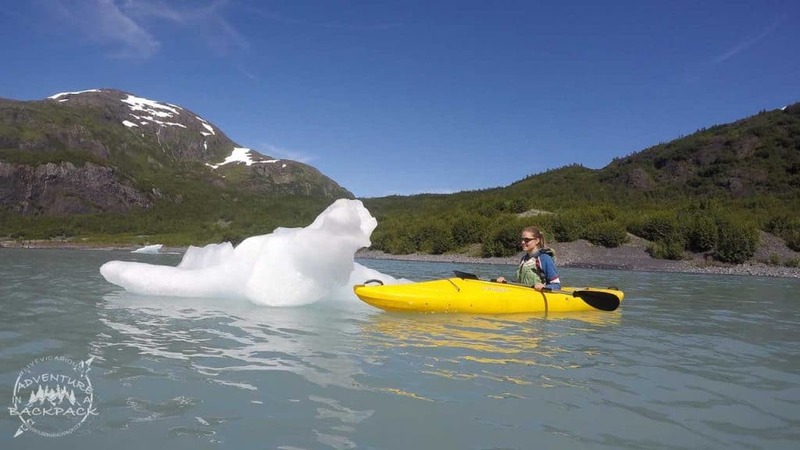 If you are planning on kayaking to Portage Glacier, be sure to pay attention to the weather and wind, as the lake is very large and can get choppy fast! 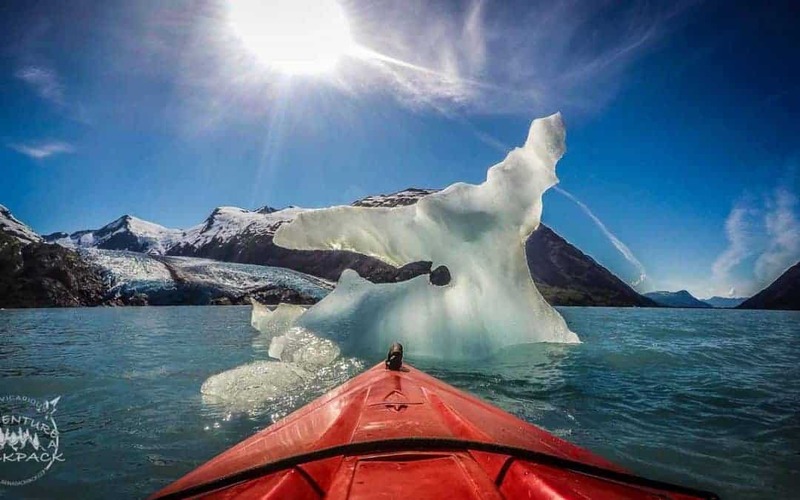 As you continue kayaking to Portage Glacier, the glacier steadily comes more and more into view. When you arrive at the large rocky beach across from the glacier, find a spot to pull in and enjoy the views. We paddled a little further down the beach, away from the people who had hiked to the viewpoint, before stopping and setting up a little area to have a cup of coffee from Kuju Coffee and enjoy the view. We paddled a little further down the beach, away from the people who had hiked to the viewpoint, before stopping and setting up a little area to have a cup of coffee and enjoy the view. 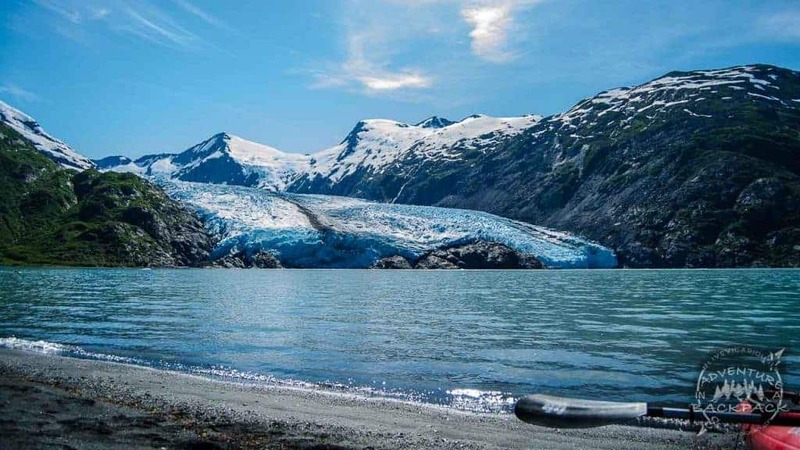 Sitting on the beach watching the glacier, you’ll be amazed at the vibrant blue that emits from the glacier. The ice is so deep and dense that it absorbs all other colors of the spectrum except blue. Portage Glacier coming into view from on Portage Lake. The waterfalls on the lake are amazing, but we were itching to see the glacier! Portage Glacier is massive and beautiful, although it is not even close to the size it originally was hundreds of years ago. As you sit across the lake from this impressive landform, you become awestruck by the shear vastness of what it was and what it is now. And as you sit admiring the beauty, you hear what sounds to be thunder. No, a storm is not approaching; this is the sound of an iceberg breaking off of the main glacier and smashing into the icy waters below. If you are watching the right place at the right time, you will see the chunks of ice falling, hitting the water with a wall of water spewing up above. Then as you wait a little longer, you see the wave coming toward you. It’s not a huge wave by the time it reaches the beach, but it is enough to displace the icebergs that have settled near the beach. As we sat on the beach for about 45 minutes to an hour, we saw four large chunks fall from the glacier and into the water below. Portage Glacier is so beautiful. The massive chunks of ice falling off of it into the lake below sound like a thunderstorm approaching. 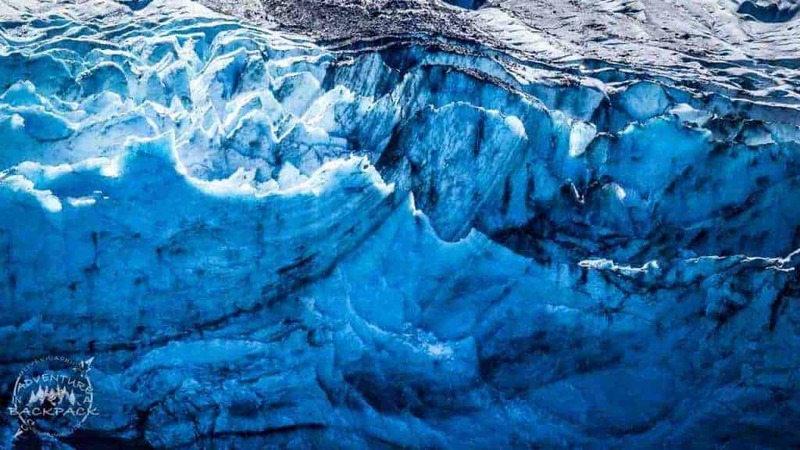 The glacier is blue due to the density of the ice in it. All other colors of the spectrum are absorbed except blue. These chunks that are falling off of the glacier are the exact reason why the closest viewing point is on the beach across the lake from the glacier. These chunks can weigh hundreds thousands of pounds and could kill someone if they fell on them. Additionally, the wave, while not a problem on the other side of the lake, could flip a kayak or paddleboard where it is larger at the origin. Nate originally wanted to try to get closer to the glacier, but after seeing one of those fall into the water he quickly understood why that is not permitted on the lake. Icebergs fall from the main glacier into the lake below, causing a wave that could toss a person off of a kayak or paddleboard if too close to it. The beach across the lake is a safe distance away from the wave, and a spectacular viewpoint. Another danger of this lake is the icebergs that are in the water seemingly sitting still or floating across the water calmly. However, you should be very careful around them in the water. 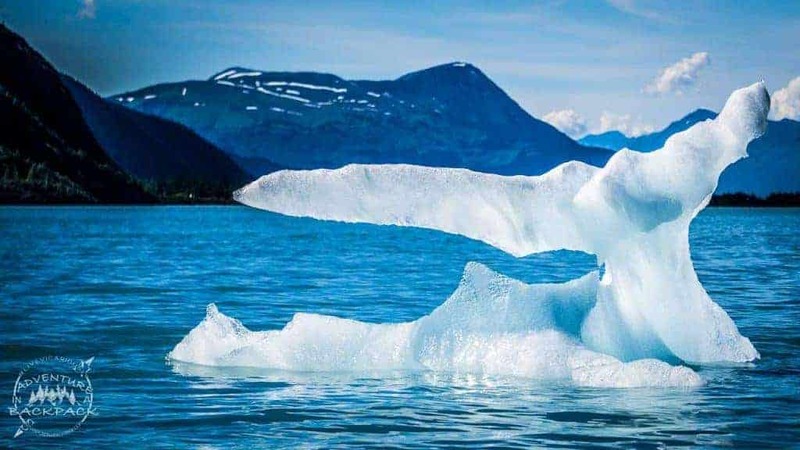 As the ice that is exposed above the water melts, the bottom of the iceberg will want to float, causing the entire iceberg to roll. We witnessed several of the very large icebergs rolling and even one breaking in half while we watched on the beach. While they seem harmless at first, please be aware that icebergs should not be approached without extreme caution. You can see how large these icebergs are, and this is just the tip. Please use extreme caution around icebergs, as they can roll at any time. Since you really can’t approach the glacier anyway, it’s a great viewing experience from the beach across Portage Lake. On a clear and sunny day like we had, you can enjoy the beach and the scenery for as long as you please. After deciding to paddle back across the lake from Portage Glacier, we continued on our journey and into Portage Creek. If you want to kayak down Portage Creek without kayaking to Portage Glacier first, you would park just north of the Begich Boggs Visitor Center, under the bridge. There is a boat launch there and is the easiest access. Since we had paddled to Portage Glacier first, we paddled along the shoreline of the lake to get to Portage Creek. Portage Creek is a relatively short 6-mile paddle. Most of the waters are swift but not rapids. However, the upper portion of the creek was very shallow when we paddled it, causing a few issues for us. The creek splits into two sections about a mile into the paddle, and we chose to go to the (paddler’s) left arm. We think that going to the right would have been a better option, as there were several other paddleboards, kayaks, and rafts that came from that arm when the river merged back into one flow. While we didn’t ask them, they didn’t seem to be concerned nor wet, as we were. Haha, it makes for a good story, though! The rest of the paddle was uneventful, and it was only about a mile to a mile and a half that was shallow and bumpy. Kayaking down Portage Creek provided great scenery, although the left arm that we took was a tad shallow. 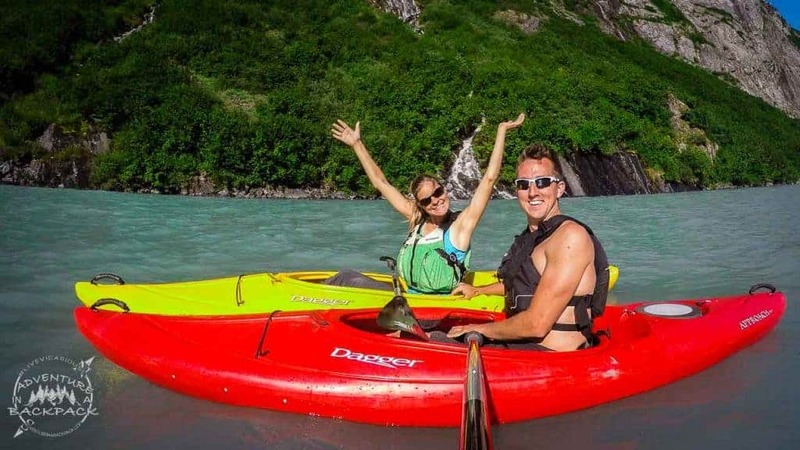 Kayaking down Portage Creek, you are surrounded on both sides by the vast mountains of Portage Valley. The creek winds its way through the valley offering potential sightings for moose, bear, and bald eagles. 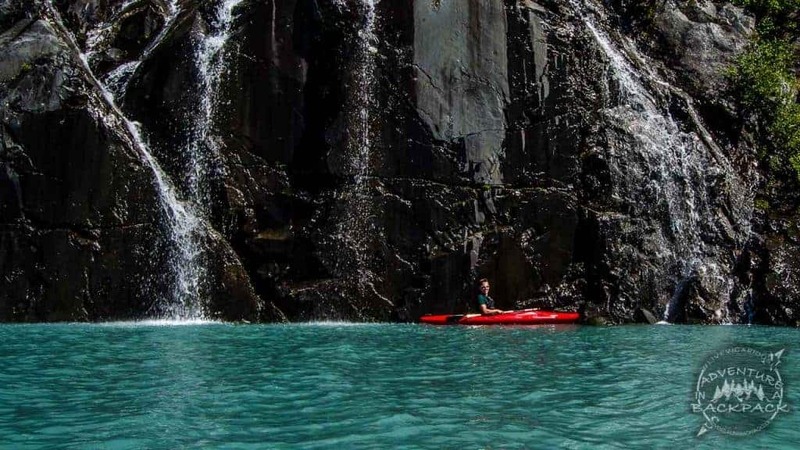 While we saw none of these, the scenery was still spectacular and well worth the paddle. Reaching the end of the Portage Creek, you come to the mouth where the creek meets the Turnagain Arm. At this point, we paddled to the left, under the bridge, and over to the parking area where we had left our bikes earlier in the day. Hopping onto our bikes and beginning the journey back to the car, we rode along Portage Glacier Road for just about a mile or two before reaching Black Bear Campground, where a hike/bike trail begins. This trail continues winding through the valley all the way to the Begich Boggs Visitor Center. The trail is surprisingly very nice, consisting of some dirt trail, some boardwalk, and several bridges. 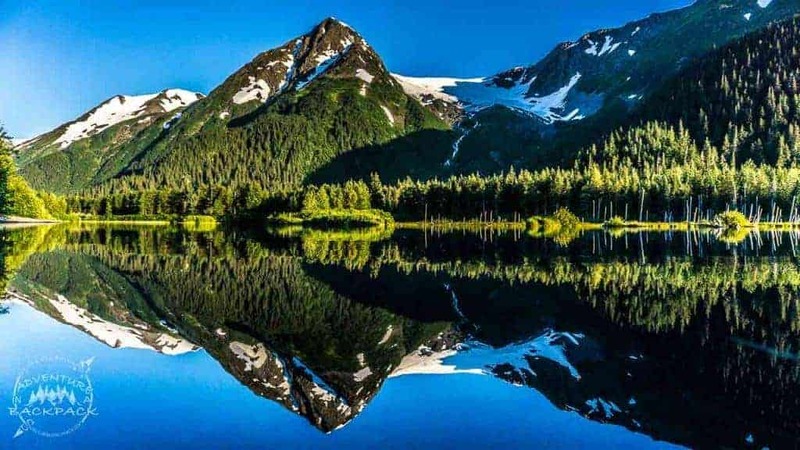 The viewpoints along this trail are spectacular, and even if you are not kayaking down Portage Creek, we definitely suggest taking a hike or bike ride along this trail. The views will not disappoint. 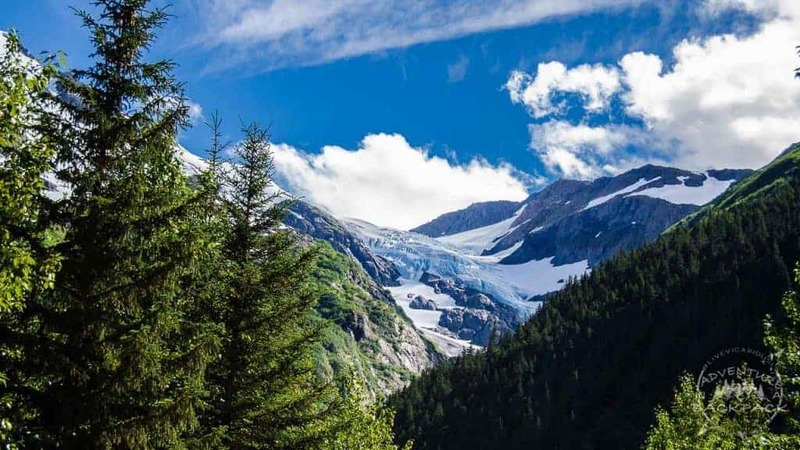 This gorgeous view is just one of many scenic areas along the hike/bike trail back to the Begich Boggs Visitor Center. When we were about a mile from the Begich Boggs Visitor Center, we saw a spectacular sunset. But that’s when we also realized that we had been out all day, as the sun doesn’t set until around 11:30 pm. While this isn’t usually a problem, we had Nate’s Mom visiting us and we knew she would be worried. We hadn’t had cell signal all day! By the time we got to the car and drove far enough to get signal, she had only just texted us about 10 minutes before. Phew! We pulled over at the RV before going back to pick up the kayaks so that we could let her know we were fine! She wasn’t too worried; she knows we are very skilled at staying safe! She was more concerned about us not eating dinner yet – which I was also concerned about! After heading to pick up the kayaks and getting some food in us, we finally had time to debrief about the day. We realized at that point that it took us around nine hours from start to finish. No wonder we were beat! We spent about 6 hours kayaking to Portage Glacier and back, including the time that we spent on the beach. Kayaking down Portage Creek took about two hours, as we did stop once for a snack and to assess any damage to our kayaks from the shallow waters. The bike ride back was the quickest and easiest, at about an hour total. We had a spectacular day even though it was a long 9-hour day! This view was worth it! This whole adventure could have easily taken much less time, but we did spend a long time taking pictures of waterfalls as we paddled to Portage Glacier and back. The lake was spectacular, and we didn’t want to rush it at all. On the flip side, it could’ve easily taken much longer, as any amount of headwind makes for a very difficult paddle on Portage Lake. You could easily spend more or less time on kayaking to Portage Glacier, as we did spend a while enjoying the views. 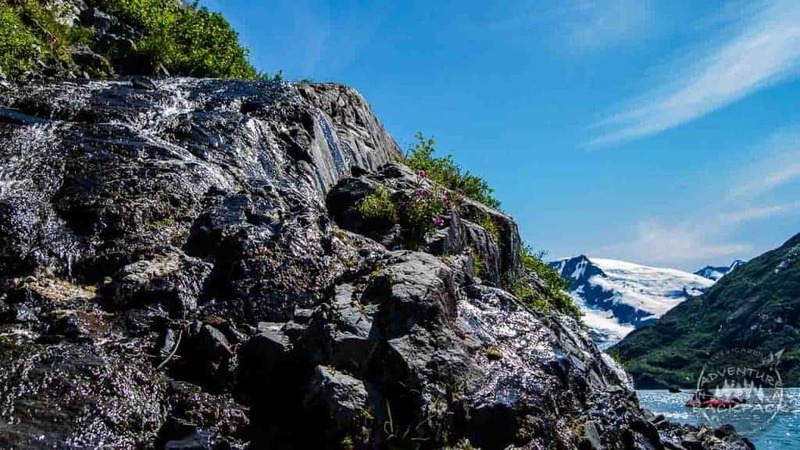 Overall, we wouldn’t have wanted to do it any differently (aside from taking the right arm on the creek), and we had an amazing experience getting to view Portage Glacier and the surrounding Portage Valley. Adventures are all about unpredictability and being prepared for whatever comes up. This adventure definitely lived up to that standard! We hope you enjoyed reading about this adventure and we hope we inspired you to go take an adventure of your own! Let us know what adventures you have planned next! Subscribe below for all of our most recent updates. Until next time, #LiveVicariously!